Wow! A whole new set of Tim Tam flavours have been launched. And with funky packaging too! This new range has been ‘inspired by Gelato Messina’. For those of you who have not heard of Gelato Messina, it’s a posh ice-cream shop, and currently flavour-du-jour of the hipster classes. Move over Zumbo; this is the new cool in desserts. Arnott’s have clearly read the zeitgeist, ditched the patissier extraordinaire, and hope to ride the gelato craze. There are four new flavours: Mint Choc, Coconut and Lychee, Black Forest and Salted Caramel Vanilla. Now, you may be excused for thinking that sounds all a little familiar. Arnott’s have previously ranged Mint, Coconut, Black Forest and Salted Caramel versions of Tim Tams. Indeed, some of those flavours were apparently created by the great Adriano Zumbo himself, so it must be a bit galling to not only be dumped in favour of an ice-cream parlour, but for them to steal your flavours too. It was the Mint Choc I tore into first. To be honest, I was super-excited. 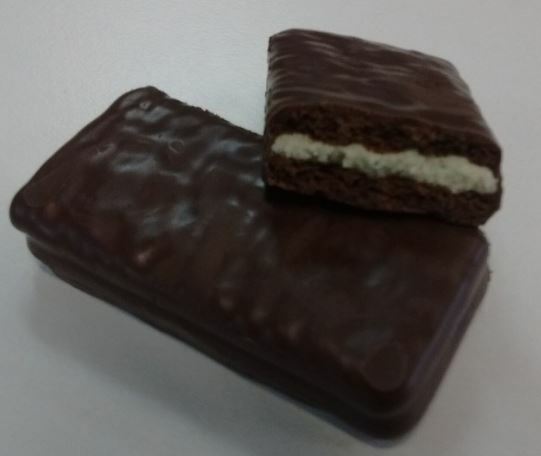 The previous Mint incarnation of Tim Tam was, in my opinion, one of the finest Tim Tams ever made, and I was hoping that this would be the same biscuit, dressed up to capture those oh-so-fickle millennials.